China’s new space telescope will probe many mysteries of the universe, including the belching “big eaters” — active galactic nuclei at the most remote edges of the universe. Scientists have discovered that almost every galaxy has a supermassive black hole with a mass several million to several billion times that of the Sun at its centre. With their mighty gravitational attraction, the supermassive black holes engulf the surrounding gas and dust, Xinhua news agency reported. The jet-flows and accretion disk of the supermassive black hole generate X-ray radiation strong enough to travel billions of light years. These galaxies have very bright nuclei — so bright that the central region can be more luminous than the remaining galaxy. Scientists call them active galactic nuclei. 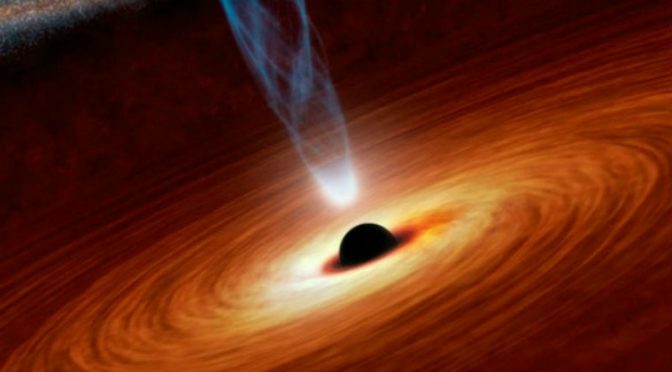 “Since the active galactic nuclei are very far from the Earth, our telescope can only detect the brightest ones,” Zhang Shuangnan, lead scientist of HXMT and director of the Key Laboratory of Particle Astrophysics at the Chinese Academy of Sciences (CAS), said on Monday. The big eaters are full of mysteries. Scientists have found the double jet phenomenon is very common in galaxies with active galactic nuclei, but they don’t understand why supermassive black holes cannot engulf all the matter falling into them. Supermassive black holes are very different from black holes of stellar mass, which are formed when very massive stars collapse at the end of their life cycles. Scientists are still not clear how supermassive black holes are formed and grow, which is a key to understanding the evolution of galaxies. HXMT’s observation is expected to help scientists see the core region close to the event horizon of supermassive black holes at the centre of active galaxies and gather information about the extremely strong gravitational fields, Zhang added.